Courier transforms the process of sharing your media, by doing away with lists of files and replacing them with the analogy of an envelope you put in the post. 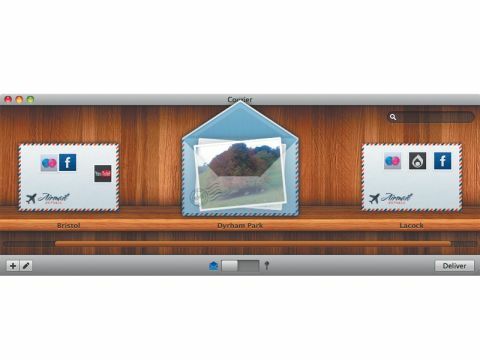 Pop your photos in the digital envelope, stamp it with the service you'd like to upload it to and hit Deliver to send your images off to your chosen location. It supports popular services including Flickr, Facebook, YouTube, Vimeo and FTP, and you can add others as plug-ins, such as TwitPic. All you need to do is authenticate each account and Courier does the rest. Courier looks the part from the moment you open it. The app has a gorgeous interface that feels right at home in OS X, and is slightly reminiscent of the excellent Delicious Library. You can tag media you add and give each a description, although annoyingly you can't tag batches. Certain services also enable you to upload to a specific album, which can save you time. It's a fantastic idea that works well on the whole, but it's blighted by a series of niggles. Despite its stunning looks, finding your way around isn't all that intuitive, and the interface's sparse nature can make it difficult to know what to do next. For example, if you try to deliver an envelope without stamping it, Courier tells you that action can't be completed, but it doesn't offer you an instant way to rectify the problem. And the Stamp button on the user interface looks more like a pencil than anything else. Frustration can easily ensue. There are other areas where this lack of intuitiveness undermines Courier – when an FTP upload went wrong, for example, we weren't given any reason why. Such instances are a shame, because this could be a gem. Fingers crossed for the next version.